Meet Luhr Jensen’s buoyant Jet DiverTM System. It’s a simple-to-use trolling system that accurately positions a lure at 10, 20, 30, 40, or 50 feet with the added attractions of motion and color. Simply tie on the correct Jet DiverTM that matches the depth you wish to reach, attach your favorite lure 4 to 5 feet back, let out 100 feet of line and begin trolling . . . the Jet Diver does the rest! This straightforward, no-nonsense trolling system is the result of angler demand for specific depth capability without all of the complexities of downriggers, lead weights or wire line. It produces the right depth, each time, every time . . . no gimmicks, no complicated instructions, and no mistakes. • Luhr Jensen’s Jet DiverTM Buoyant Diving Planer . . . floats at rest. 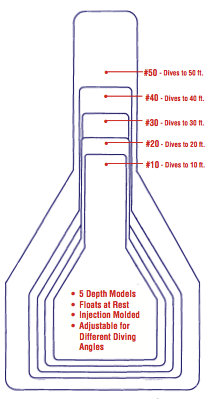 • Five depth-specific models provide a complete trolling system to 50 feet-plus. 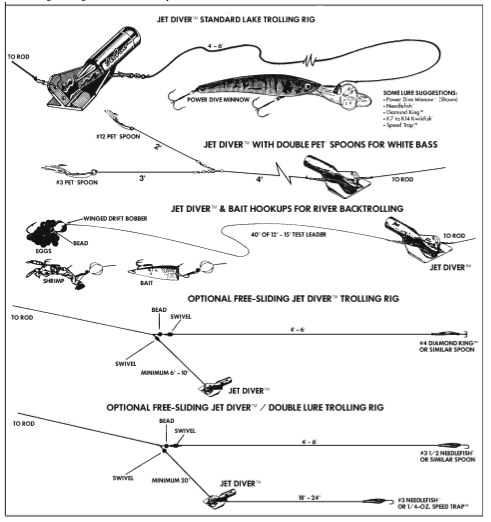 Using electronics or fishing knowledge to determine the fish-holding levels, attach the correct Jet Diver and quickly be at that exact depth. • Quick-change snaps allow instant change of diver size and/or lure-and- leader. • Injection molded plastic is tough and virtually indestructible. The complete, five-size Jet Diver system allows you to reach specific depths from 10 to 50 feet, depending on the size Jet you choose. “Jet 10”, for example, will reach 10 feet and can pull small lures and spoons such as Super Dupers®, Needlefish®, Kwikfish® or small spinner and bait combos. Each succeedingly larger Jet size will position your line 10 feet deeper, with the “Jet 20” reaching 20 feet, “Jet 30” – 30 feet, “Jet 40” – 40 feet and “Jet 50“- 50 feet. As the size increases, so does the Jet’s ability to carry larger items. The “Jet 40”, for example, will pull a large plug such as a #4 J-Plug®, 4-1/2″ Power MinnowTM, Hot Lips Express®, Power Dive® Minnow, size #14 Kwikfish or even a small dodger-and-fly or dodger-and-spoon combo. C. by releasing more line. used with lines testing 17 to 25 pounds. Again, maximum dive can be attained with smaller diameter line, slower trolling speed or by releasing more line. In research tests, for example, on 17-pound test main line a “Jet 20″ with 100 feet of line out trolled at 2 mph reached 22 feet carrying a No. 4 Diamond KingTM, high-action trolling spoon. This same outfit trolled at the same speed with 150 feet of line out reached 27 feet. 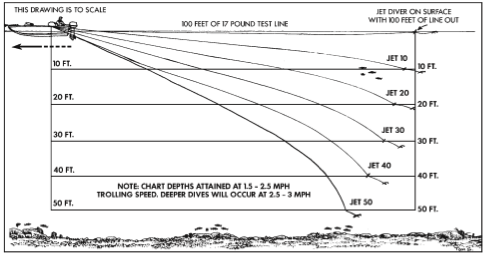 With more than 150 feet of line out, tests show the buoyancy of the Jet Diver and the upward force of the line combine to limit further diving capability. you can see how far out behind your boat it is, before the actual dive begins. In river situations, buoyancy becomes a huge advantage because the diver will not sink to the bottom and get hung up . . . a little slack line will immediately push it downriver and off of most any obstruction. If you do happen to break it off while trolling, the diver will pop to the surface, allowing for easy retrieval. Use a Jet Diver as the diver/planer instead of a lure such as the Hellbender. The Jet Diver won’t foul when it hits underwater obstructions whereas the Hellbender gets bent in the bill area. It doesn’t cross up in turns and pulls two-thirds less than a Hell- bender when trolled at optimum speeds. Your Jet Diver comes equipped with two quick-change snaps; one on the forward fin for main line attachment, and one underneath for leader-and-lure attachment. By attaching your main line to the front fin snap, you can then change Jets in seconds by simply unsnapping one and snapping on another. The second quick-change feature involves the underneath snap to which your leader-and-lure is attached. By pre-rigging several leader-and-lure combinations with snaps already at- tached, you can instantly change from one to another by simply opening and closing a snap. You can conveniently protect and store these pre-rigged combinations in one of Luhr Jensen’s handy Leader ToteTM leader and lure wallets.